Gunung Irau (not to be confused with the mountain in Papua of the same name) is the highest peak in the popular Cameron Highlands, a plateau developed in the 1930s and named after Scottish geologist William Cameron who first surveyed the area in 1885. The road winding up from Tapah to the main town of Tanah Rata is quite exhilarating and the region is an extremely popular tourist area today. Located on the main Titiwangsa mountain range, Tanah Rata lies at an elevation of around 1,450m above sea level. The temperature is delightful and allows a wide range of plants to be cultivated, including fruit, vegetables and most notably tea – the vast Boh tea plantations cover the north-east end of the plateau. The main road in the Cameron Highlands runs between Tanah Rata, Brinchang (sometimes spelt Berinchang) and Kampung Raja near the tea plantations and there is a regular, cheap bus running back and forth throughout the day. In the past, the area has been popular with hikers, with local tourist maps detailing numerous jungle trails. Today, the main attraction aside from the tea plantation, local produce and tourist stalls is the so-called Mossy Forest, a boardwalk along a ridge on Gunung Brinchang (2,032m) which is the second highest peak in the Cameron Highlands and usually combined with Gunung Irau on the same trek. The hiking opportunities ought to be great, but recent local mismanagement and lack of reliable information means it is often a rather disappointing and regimented experience. There are signs for the Mossy Forest everywhere, and it appears to be the number one tour offered to tourists in Tanah Rata, whether for sunrise or as a half-day out in combination with a trip to the tea plantation. For experienced hikers, there is nothing particularly special about the forest here as it is quite normal for mountain ridges of this elevation in this part of the world to be ‘mossy’. It is the accessibility (most of the time!) that has lead to its considerable fame and popularity. Gunung Brinchang (or Batu Brinchang as it is also known) can actually be driven up and is the highest section of road in all of Peninsular Malaysia. The junction for the Brinchang mountain road is opposite the Cameron Square shopping mall (1,605m) and it is around 6 kilometres from here to the summit ridge. This access road is steep, narrow and pot-holed in some places but despite what you hear, most regular cars should be fine if driven by careful and confident drivers. Most people go on tours arranged in Tanah Rata and the biggest problem you will encounter (other than the long list below) is the sheer number of other cars on such a narrow road. For those who prefer to walk up, allow around 2-3 hours to hike up to the Mossy Forest entrance and 2 to descend. Looking at the maps and the shape of the mountains, and ignoring the bureaucracy and hassles noted below, the best full-day trek would be to follow what used to be called Jungle Path 1 (more recently Brinchang Barat trail) from the outskirts of the town of Brinchang (1,500m) and ascend to the communications compound and towers at the top of Gunung Brinchang (2km, 2 hours or less) before somehow squeezing along the side of the compound fence then walking 600 metres northwards along the summit access road, entering the Mossy Forest walkway (1,972m), heading out to Gunung Irau (allow 2 hours each way) and then back out at the Mossy Forest and just under 6 kilometres down the road through the Sungai Palas tea plantation to the main road (1,605m) where you can catch a bus or taxi back to Tanah Rata or wherever you are staying. Total hiking time would be around 8 hours not including breaks. The section between the Mossy Forest entrance and the summit of Irau is not as simple as it might appear. Although it begins as a boardwalk (sometimes known on maps as Jungle Walk 14), and only 2.35km long, the ridge leads up and down and goes via Mini Irau (roughly 2,050m elevation) which is a false peak and is also sometimes used as a campsite. Much of the trail is very muddy, yet quite pleasant moss forest. That is why it takes most people two hours in each direction. Unfortunately, there are so many problems with this fairly simple plan that we have decided to produce a list, to help visitors be aware before they arrive, and also on the off-chance that the clueless authorities see sense and simplify matters for adventurous tourists. Gunung Irau, Gunung Brinchang and (more surprisingly) the Mossy Forest are usually closed three months of the year (start of November to end of January). 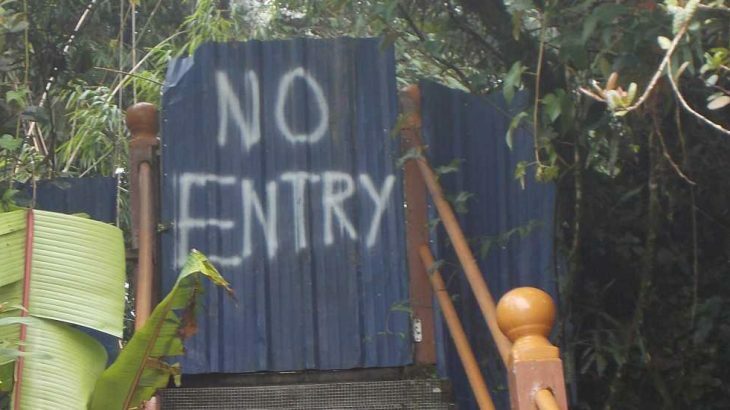 This is not widely-publicised online or even in Tanah Rata, so many people plan their trips assuming it will be open to find, very disappointingly that it is closed and all are forbidden from entering. It is basic manners to publicise such important information – a simple website of tourist sites in Malaysia and seasonal closure times would be very simple to produce and save many folk from wasting their time. If the forest needs to be closed for a period, it seems odd that it is still closed in January as the wettest months are in April, May, September, October and November according to average rainfall graphs. Despite the closures (which could of course change from one year to the next), most tour operators in town (including the so-called Tourist Information Centres which are commercial rather than impartial as you would hope) are happy to sell people tours to the Mossy Forest and then lead them on a disappointing, shortened tour lower down or on a side trail but for the usual price. This is very poor manners. The road up to the Mossy Forest is in sufficiently poor state for all taxis to charge extra to take you up there, and all motorbike hire companies to forbid you from taking your motorbike up there (or lose your RM100-150 deposit). This is a very odd situation, but as common in Asia, it is often in local folks’ interests to keep roads in bad shape in order to have an excuse to charge you more. Again, this is very poor form and should be rectified either with a newly-surfaced road, or with a local law to prevent overcharging. Given that most people want to use a taxi or bike to visit the Mossy Forest and most other places can be visited using the very affordable bus, tourists ought to think whether it is worthwhile renting a car or taxi. The area ought to be wonderful for trekkers, but the authorities seem intent on closing trails. Jungle Trail 1 (Brinchang Barat) is apparently closed permanently with warning signs at the old entrance near the water treatment works. This may be to do with the installations at the top of Gunung Brinchang, but it is pretty disappointing for tourists. Most obviously, it means you are not able to do a decent full-day circuit of the highest peaks as suggested above. At present, we have a really weird situation of tourists either not being able to hike in what should be a wonderful hiking area, or else getting onto the trails by climbing under or over barbed wire and past warning signs. It remains unclear if lesser peaks in the area such as Gunung Berembun (1,812m) to the east of Tanah Rata is also closed. The whole region, including the access road itself, is covered in ‘keep out’ or ‘no entry’ signs. This gives a very poor impression and makes you feel unwelcome and in some kind of strange outdoor prison with perimeter fences. Not very friendly at all, especially considering that hiking in the forests appears to be increasingly discouraged by indifferent or plain inept authorities. Even if the Mossy Forest is open when you get there, in 2018, the trail was closed between Mini Irau and Irau summit due to a landslide area. As far as we know this is still the case in January 2019. One wonders if the authorities simply like putting up warning signs and such like or whether they actually intend to fix the trails and re-open them as soon as possible (which they would do if they were competent and respectful of visitors). Finally, even if the whole trail to Irau summit is open, the hassles of getting a ‘permit’ to be allowed to continue to Gunung Irau are more than most visitors will be prepared to deal with. Perhaps this is what the authorities want. It is likely that many hikers continue to Irau without a permit because of this, which is more of a risk. Much better if you could simply pay a small fee at the Mossy Forest entrance rather than search for a forestry office in Tanah Rata and have a meeting about getting permission to hike for 2 kilometres and back. It is especially difficult for foreigners, who are immediately assumed to be less competent and more likely to be ordered to take an expensive guide with them on a regimented experience. This, sadly, seems to be the norm in Peninsular Malaysia. Why can’t they make the process simple? An online booking form would suffice but even that appears to be too difficult for the authorities to manage. In view of the above issues, an alternative, very different and more demanding approach from the northern road (1,400m) near Green View Garden via Gunung Pass (1,587m) and Gunung Yellow (1,667m) night be preferable, although availability of guides is uncertain. It would certainly be much quieter, far from the tourists, restaurants and weekend traffic jams of the Tanah Rata – Brinchang road, and is apparently doable in a day. Getting there: Lots of buses from KL to Cameron Highlands from both KL Sentral and Terminal Bersepadu Selatan (RM35 one way in 2018, allow 4 hours). Ipoh is the closest train station and also has bus connections (around 2 hours). Accommodation: Plenty available in Tanah Rata, Brinchang and nearby. Permits: Apparently, since March 2019 it costs foreigners RM30 per person to enter the Mossy Forest. You are supposed to get a permit from the forestry department if you wish to hike from Brinchang to Irau but in reality very few hikers do. Along with the Mossy Forest itself, Irau is usually closed November-January. Water sources: Unknown – carry sufficient bottled water with you. Note there is NO shop at the Mossy Forest. Featured, Peninsular Malaysia Spesial. permalink. Had wanted to visit the Cameron Highlands for several years, so our addition of the Peninsular Malaysia peaks was an extra excuse to go there in order to bag Gunung Irau. From Jakarta, it can be just about be done in a weekend as detailed below, but be aware of all the bureaucracy and hassles that seem to be the norm in this part of Malaysia. What should be a simple, pleasant hike ends up destroyed by the authorities. I flew from Jakarta to KL on Friday evening after work. Cheap fares at present presumably due to all the competition – cheaper to fly to KL than fly to Medan or Bali. Malaysia Airlines were delayed but genuinely professional – I felt calm onboard which is not something I can say about many flights with Indonesian airlines. As the first bus from KL to Cameron Highlands on a Saturday appeared to be at 0830 from Terminal Bersepadu Selatan (a good few kms south of KL Sentral, near Bandar Tasik Selatan train station) I looked into getting a train to Bandar Tasik Selatan or bus to TBS and booked a hotel that seemed to be close (on the map). Couldn’t find much so I ended up just getting a Grabcar for RM65 plus toll at the airport. Not ideal for a solo traveller but in Malaysia, travel is really expensive for solo travellers unless you are sticking to major towns and cities only. V hotel was friendly and at a reasonable price, but the complex road network there means it would be certainly tough to walk from the hotel to the bus terminal even though it’s really close as the crow flies. Luckily the hotel has a free shuttle (10-15 mins) if you order the night before. The bus to Freesia Terminal (I don’t think there is a second bus terminal) at Tanah Rata left bang on time at 0830 (RM35). There was a bit of traffic so it took just over 4 hours in total (a good 20 minutes quicker on my return the following day to KL Sentral). say 830 bus (first one from kl). The buses tend to stop for a 10 minute toilet break at Tapah tol road exit after 2 hours or so. COuld just about see the southern slopes of Gunung Bujang Melaka – a small Ribu not far from Tapah. From this point the road gets quite pleasant, with really dense wild windy jungle roads – and good views. Rafflesia grow in this area – Cameron Highlands itself is probably too high up (ie too cold) to see them so most of the Rafflesia tours are in my opinion likely to be halfway back down to Tapah. I was a bit surprised at how built up Tanah Rata was. Ringlet is the first town you arrive at, and it is quite a shock after the windy jungle road. There is also a serious traffic problem here at weekends, with tons of domestic tourists visiting, but not helped by the market on the main road near Brinchang. But the authorities are allowing too many new buildings and hotels to be built – this is turning the atmosphere into once very unlike what it would have been 50 years ago. If I went back I would try to avoid weekends, and maybe avoid the main Tanah Rata to Kampung Raja road altogether (take the road further north from Ipoh). But…. if you like restaurants then there are plenty to satisfy in Tanah Rata. At the little Freesia bus station the usual selection of taxi guys trying to drum up business. A large sign stating RM25 per hour (minimum RM75) but – not including to Mossy Forest! Bearing in mind that the Mossy Forest is perhaps the main destination this is quite ludicrous. Bad road up there = give us more money! When it should be bad road up there = authorities will get it fixed rather than giving local drivers an excuse to overcharge for what is a very short journey indeed (with no traffic probably less than 30 minutes, with traffic maybe up to 50 minutes). As it stands, the bus station taxis chaps will ask for RM80 one way or RM120 return to Mossy Forest. Not liking paying over the odds for a short journey, I took a walk along the main street and asked around. One taxi driver told me it was closed. Indeed, I had heard the Mossy Forest had been closed late last year, via TripAdvisor and Google Maps reviews rather than direct from the authorities, but this was after I had already booked accommodation and travel tickets so thought I would try anyway. If you’re always changing your plan to suit the whims of the authorities in Malaysia then you could well never settle on anywhere, such is their poor communication of closures and such like. Malaysia really suffers by not having an ojek culture. As a single traveller, ojeks are perfect for me in Indonesia – why should I pay for a whole car just for me? Crazy. Note that motorbike rental is possible in Tanah Rata but (here we go again) you are NOT allowed up to the Mossy Forest or your 100-150 deposit will not be returned! Just horrible nonsense. COnsidering the bus from Cameron Square (where the mountain road junction is) to Tanah Rata (or vice versa) is only RM4, why bother wasting your money on a bike if you can only use it on the main road? Finally managed to get an offer from a guy in a battered minivan of RM50 for drop off at Mossy Forest (I was planning to simply walk back down again, and not enough time to hike both directions as it was already 1pm). He kept telling me to say he charged me RM70 if anyone asked, quite tedious, presumably in preparation for him later asking for more (as he did when we reached the car park). He was also saying it might be closed but he was unsure. I just said we should go and have a look. Plenty of signs on the main road for the Mossy Forest, with no mention of closures (whether regular seasonal closures or otherwise). Lots of traffic, really quite bad – some places it would have been quicker to walk. We drove past what looked like a sign saying the road was closed, but the sign had been demolished. Was the place open after all, or was this deliberately broken by one of the many local folk whose livelihood depends on taking tourists up here, frustrated at having no business for 3 months for quite arbitrary and unclear reasons. At the Mossy Forest carpark, the driver asked me for an extra RM15. I declined. It is terrible manner to change the price like this, and if you agree to it they will try it with everyone. But I did give him an extra RM5 but I feel bad about even doing that just out of principle. There were 4 or 5 local lads on motorbikes there, plus a pickup truck presumably owned by whoever was doing the building or maintenance work. Also a Western couple of a motorbike. All quite unimpressed and shocked to see a nasty ‘no entry’ corrugated metal barrier at the entrance. Nobody working at the site – at least have manners to do the maintenance quickly and re-open it for those who have spent money and time getting to this place. Managed to get a reasonable view from near the little toilet block but it was clear I wouldn’t be able to get to Irau. It is at these times that you wonder about the positive nature of humankind. We are the only species that are banned from visiting these area – we allow the authorities to control us to the extent we are effectively living in a huge prison of micro-manipulation, over-regulation and regimentation where you need a permit to simply walk in a forest. It’s disgusting. I continued southwards along the summit ridge road to the transmitters which are at the true top of Gunung Brinchang. There’s a small cement stairway up to a partial viewpoint but this is only around 2015m. There’s also a shelter with a sign but it quite clearly isn’t at the highest point. Malaysian seem to be happy to call the not highest point of somewhere the summit, even though you’re next to a compound that contains higher ground. To get from here to the Jungle Trail 1 directly down to Brinchang you would need to push through a very tight space between bushes and fence and whether the true highpoint is in the compound or not I am not sure. I gave up as there were workmen around and the space was just too tight to bother with for what is only the second highest. Anyway, it’s difficult to recommend a hiking circuit at present and this seems actively discouraged what with all the ‘warning’ and ‘private’ signs. Hardly what you want from a hike in the forest. There were a few reasonable views either side of the road which made up a little for the problems. I walked back down the road to the tea plantation – some lovely photogenic spots including rows of pine trees lining the road and a couple of large boulders. Down at Cameron Square I got the public bus back to Tanah Rata for just RM4. Excellent. I had booked a room at TJ Lodge so went to find the place. Amazingly, the place had shut down! I complained at the TJ travel info booth (including offering trips to the ‘closed’ Mossy Forest). Disgusting how these people will happily take your money and booking but not bother to tell you that the hotel is closed or help you find alternative accommodation. After getting into an argument with the feckless Indian guy manning the booth (‘do not raise your voice, sir!’) I found alternative accommodation round the corner. Despite it apparently being rainy season (a justification for closing the trail perhaps), there was no rain whilst I was there aside from very light drizzle for 20 minutes or so. The sky remained clear and I decided to get some photos of the range from the road between Tanah Rata and Brinchang. Sadly, building developments ruin the view somewhat but you get a reasonable panorama of Brinchang and Irau and the drop between the two. Do watch out for dogs – I found what looked to be a love little hilltop with a view of the Gunungs but just as I was nearing the top I noticed a couple of dogs which promptly woke up and chased me back down to the main road! One positive – there are lots of birds in the area. I saw countless species on my walks here, even on the main road. Getting back on the Sunday was easy. 11am departure, at KL Sentral by 1450 and got the express train to KLIA. Would I go back? Perhaps to try Irau from the north but I think I’d give Tanah Rata a miss next time.